Whether we are fighting for the next position, the next #1, the next move, the next dude, or the next war, we are constantly fighting for something. The artist I was on tour with, she will more than likely hit #1 on the country charts within the next couple of weeks. I was watching the ACMs tonight and I saw my friend playing drums for one of the bands on stage. This stuff does not happen overnight, it takes a long time. My friend who plays drums has been playing for the past ten years in Nashville. The artist who I used to work with has been on stage since she was 16. So whether you like them, hate them, or don’t care for them, I hope everyone can appreciate the dedication, the time, the money, the effort it takes to get there. While life may be great and glamorous from the outside, on the inside it can be rough and dirty. I want to take this time to say in my blog to say congrats to everyone who is making strides in their career. To those who are making leaps and bounds in life. And most importantly, staying true to who they are. You deserve it. It’s funny how we discover music. Sometimes it’s through the radio, other times it’s through social media like YouTube. Most of the time, I hear about new music through my good friends. One of my friends is very good about posting on his Instagram about upcoming artists/damn good artists in general. Because let’s face it, we all don’t want good music to die. Maren Morris has been around for a while,but now, is starting to get her career going. She recently opened three nights in Nashville for Chris Stapleton and she will be going out on tour with Keith Urban. Talk about making some progress, she’s on a roll! But it’s mainly because, she’s down good ol’ country. You know, like what country is really about. Telling stories about life. Her tunes are catchy and the melody is something you can rock out to with the windows rolled down. And the best part is, she only has an EP out, which means, she doesn’t even have an album out. I can’t wait to see what she comes out with next! Dating is such a weird thing. Because it’s a grey area of “do I like you, or do I not like you”. Will this work, what if it crashes and burns? But just remember, everyone is in the same boat. Everyone is an idiot when it comes to dating… right? There should be more songs about awful dates, but I think it’s more fun to write about drunk people… right? Ryan Hurd, an upcoming country artist in town is singing about it. As we speak. I’ve seen him perform a couple of times now. Obviously being a guy, it’s much easier to write about drunk people and girls… right? Yeah, I think so too. I’m lucky enough to know the guys that won’t the song with him. It’s catchy and it’s true! If there is one thing I can appreciate about the new upcoming country artist in Nashville. They are real, they write about real things and it’s meaningful. …Well I don’t know about drunk people, but the rest of country music! Yay! According to WordPress, It’s my four year anniversay on WordPress… Now, where’s my hot toddy. …Oh wait, I’m already drinking it. Today in Nashville, we are having a “snow day”. Don’t get me wrong, it’s cold here… but there sure ain’t no snow! And that’s why I’m drinking a hot toddy. But with that being said, there’s a lot of people that are in Nashville that are from the south. Which is not a bad thing, especially when it comes to music. A lot of southern musicians started singing in church. Heck, look at queen bee AKA Beyonce! I’ve always had a thing with music from Texas. Especially Texas country. Don’t get me wrong, I like music from all different parts of the country, put Texas country really hits home with me. I’m lucky to call my Ryan Beaver my friend. He was one of the first people I met here, and I try to go see him perform whenever I can. Because damn, it is some good Texas country. Rolling Stone named him one of the top country artists to watch for, he’s also been on Sirius XM radio and has over 30,000 monthly listeners on Spotify. If you don’t believe me, take a listen for yourself. I decided to go out a couple of weekends ago to see Edens Edge at a local bar in my area. First off, I should let you know, I bought their cd during the summer time for around $6. Yeah… now they are singing the national anthem at football games. It’s amazing how much one single hit can get a band so famous quickly. But get this, they toured with Little Big Town, Rascal Flatts, Brad Paisley and more ,yet they are still playing at local bars. Eh, whatever, locals can listen to good music and not have to fork up an arm and a leg for it. I’m col with that. However, they are still a young band and they have a long way to go and still have much more to work on as a group. I started listening to them because they remind me of a band I really like called the JaneDear Girls. Naturally ,I streamed their music and low behold they had some pretty good music. Edens Edge I think can will become something more as long as they work on their best asset: harmony. When I saw them live, I really liked the fact that they didn’t play to many cover songs. They only have 10 songs on their album so I was worried it was going to be nothing but cover songs. Surprise, surprise, they played all of their songs on the album. Of course know one knew them except me. I love their harmonies. When they all sing together it’s pretty cool when they hit a chord at the same time. Could they work a little more on the performance on stage, sure, but every performer needs to work on that. However, for a band that is up and coming, I think they could use a different drummer. But otherwise they sounded great and not many pitch problems. Overall, good concert, I would see them again. Edens Edge live in concert. I love concerts, I’ll do whatever I can do to go to a concert that I’m like freaking out about … … which is why I went to the Eric Church concert. He is one of my favorite artists of all time, I HAD to go. I’ve been listening to him since my senior year of high school, I wasn’t going to miss him coming to town again. So I forked up a pretty penny to see him. OK so it wasn’t that much, but for a recent graduate that has three jobs, it was a pretty penny for me. Overall the concert was great. It was on time, and the crowd was really into it. Here is the breakdown of each artists. Kip Moore was the opener, I was very excited to see him because I love his album ” Up All Night”. He only played for 30 minutes but that is expected for the opening act. The really cool thing I loved about him, he didn’t play any cover songs. He played all of his songs. Too me, that is a big deal, especially since he’s not ” big” in the country scene just yet and he doesn’t have many songs. For someone opening for Eric Church, I’d say he did a pretty damn good job. He and his band were in tune, the crowd was really into it and most importantly Moore was excited to be on stage even if it was for 30 minutes. To be completely honest, I like Justin Moore music, and I wanted to see him perform, but at the same time, I wasn’t thinking ” Oh my god, I have to see him”. But I love being proved wrong, because he is definitely worth going to see. Like Kip Moore, Justin Moore played all of his songs but the one thing I noticed about him. He was so humbled to be on stage, he did a sort of “Tebow” pose for about a minute or two but he was just literally on stage listening to people screaming and you could tell he was blown away by the crowd’s reaction. 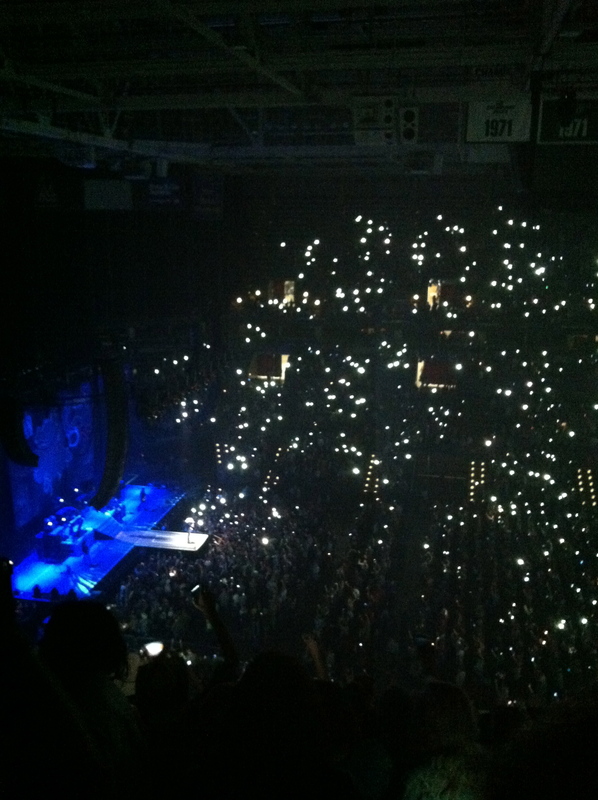 He also got the entire crowd to pull out their cell phones and light the whole arena which was really cool. Below is a picture to show you what I mean. It was extremely bright in there and it was pretty cool to see everyone listen to him and his music. Overall, he was probably the best entertainer when it came to the three and he put on a good show. I would go see him again. I’ve never heard 30,000 people scream so loud in my entire life when Eric Church came on. When he came on the stage, it was as if the world stopped and everyone forgot their problems. I loved his part of the show very much. He had multiple backdrops for different songs, he had pyro, it was pretty cool to see it all put together on stage. I loved how he played his older songs from his previous albums, but the coolest thing about his show, he played almost every song on his newest album ” Chief”. I thought that was so awesome, nowadays, most performers just play all of their hits. I loved that he played “Country Music Jesus” and ” Jack Daniels”. I seriously thought it was so cool that his concert was literally based around his new album and that he actually played his songs of f of his album. Seriously, you have no idea how excited I am about this. Because there are a lot of good songs that are on albums, not just Church’s, but other artists in general, but you never hear those songs live because it’s not a “hit”. I like “hit” songs, but it’s nice listening to the music you never hear. Seriously , I can’t get over it! What was even cooler, you could hear the crowd sing every word of every song. I also love how freakishly talented he is. He plays guitar, banjo and piano. I love a guy that can play piano. And of course he saved the best song for last ” Springsteen”, my summer song of 2012. I swear when he played piano and sang ” Springsteen” I got the chills. I could listen to him play it live every day of my life. Actually ,I had chills the entire concert that’s how good he was. Honestly, if you didn’t see him in Milwaukee or while he is on tour, you are missing out because he is one heck of a musician. Overall, the concert was so worth going to!